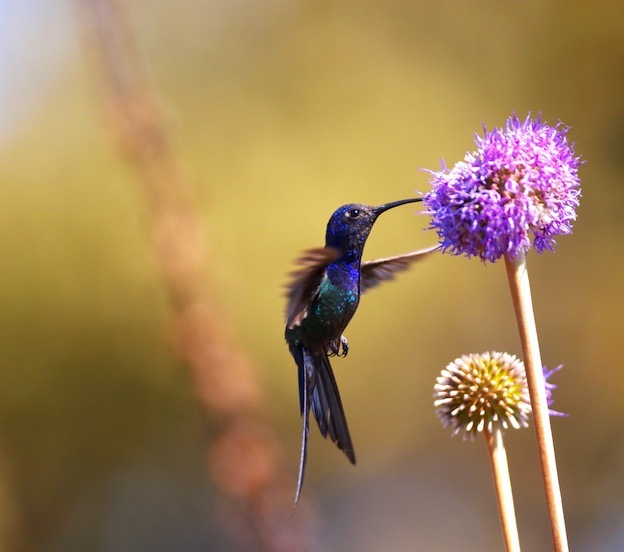 One of the prettiest of all Hummingbirds is the Swallow-Tailed Hummingbird. It offers very vibrant colors that come together to complete an amazing look. There are 5 subspecies of this particular Hummingbird and due to the many different colors they are often confused as being various types of birds instead of in the correct classification but they all have the same tail design which is a way to ensure you know what you are observing. The species of Hummingbird is very long and thin. It features a swallow like tail which is where the name of it comes from. The coloration of the Swallow-Tailed Hummingbird is very pretty. It offers colors of blue, green, purple, black, and gray. There can be various blends of all these colors that help to complete the look. Some of the shades are light and others are dark to help this bird blend into the natural habitat. The overall body length of this Hummingbird is about 6 ½ inches. However, they can be much smaller based on the subspecies and the region where they are located. They weigh approximately 9 grams so they are considered to be one of the larger species of Hummingbirds in the world. They feature a head that is round and a long, thin beak. Many people believe that they look similar to a parrot due to their coloration but the facial differences are what ensures that the two don’t get confused. The Swallow-Tailed Hummingbird is found in various regions around South America. Some of the common areas where you will find them living include Brazil, Bolivia, and Rio de Janeiro. They are found residing both in the woodlands and along the savannahs. The Amazon Basin is a prime location for them due to the fact that so many types of food sources grow in that area. They tend to stick to areas that are dry though and not those that are humid. While the Swallow-Tailed Hummingbird does migrate like other birds, they don’t go the distance of others but rather just a short movement which is very interesting. They do very well in the wild but this is one species of Hummingbird that will almost always die in a short period of time if they are placed in captivity. The Swallow-Tailed Hummingbird delivers loud chirps and they are often viewed as more like clicks. They seem to have different meanings based on the speed of the delivery. For example when one is excited or fears that they are in danger those chirps are faster. They are very aggressive when it comes to protecting their habitat and their resources for food. They tend to really only interact for mating and for migrating. There are plenty of resources in most regions where the Swallow-Tailed Hummingbird lives that they can depend on for food. Their diet consists of nectar from plants and from small insects that happen to be around. The nectar offers them the sugar they need and they get the protein they need from the insects. Some studies indicate that the Swallow-Tailed Hummingbird engages in mating all year long in many areas instead of having a set season. The males perform the various flights that the Hummingbirds are famous for in order to gain the attention and approval of a female to mate with. The females will create a nest at least 50 feet off the ground in order to do her best to offer the eggs a safe place to be. There will be either one or two eggs that will hatch in about 15 days. They don’t have any feathers but they will start to emerge when the young are about 5 days old. After about 3 weeks they will be strong enough to fly away and to survive on their own.